Before the start of Tuesday’s opening night show of ‘The King And I’, the president of the DSM let the audience in on a bit of back story. It turns out that he had once asked Richard Rodgers what his favorite of all the Rodgers & Hammerstein musicals were and Rodgers didn’t have one. However, he did make it very clear that he believed the best of their work was ‘ The King And I’. There is good reason why this play has stood the test of time. It is so very brilliantly well written. Yes, it has a few good songs in it, but more importantly it is an absolutely fantastic piece of writing. It is clever, whitty, and at times funny. Yet, it is in the moments where Anna and the King really lay into each other that the show shines most bright. It probably helps quite a bit that the performers were all so good. Most of you will likely know the tale of young Anna and how she has come across the sea to teach the royal children of Siam the ways of the western world. You also probably know about the mean old King that makes her life a living hell until she begins to warm his heart a little bit and develop a friendship she will never forget. You know this because the story is older than most alive today and there have been multiple films based on it. Still, the way to see it is in the theater and luckily the version playing right now in Dallas is quite superb. The performers are top notch, sound was quite good the night I saw it, and the songs are sung the best I have ever heard them. I will have to admit that my previous experience with this play was with the movie, but that’s a classic film and this is even better. The sets are pitch perfect. The costumes are impeccable. Honestly, I could go on and on about the quality of the production. In fact, the only issues that I saw were a few times that the actors mic went out for a single word and the actors playing the Burmese characters are difficult to understand sometimes when they are singing. Those are small issues though. for the most part, this musical rendition of ‘The King and I’ is an absolute marvel and well worth the price DSM is asking you to shell out. So, if you are wanting some quality entertainment this week, don’t go see ‘Get Hard’ or ‘Home’. Both of those movies are doing good at the box office, but they are also both terrible. 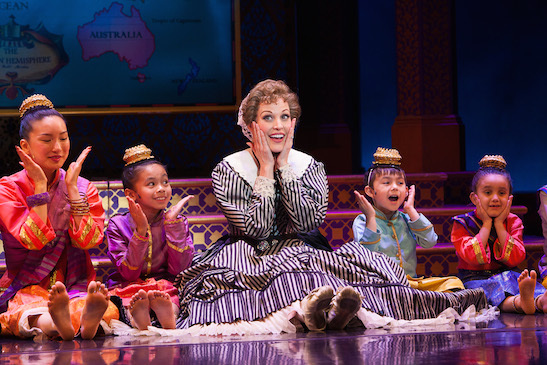 Go see ‘The King And I’ instead. You will be happy you did.